In case more candidates than one become eligible for the award of medal, the medal shall be awarded to only one candidate, who got more number of "A" grades during the degree programme. If the number of "A" grades of such candidates are also equal then the number of "B" grades will be compared. For the purpose of these regulations, the candidates qualifying for the award of a degree in a passing year/calendar year (irrespective of their semester/session of admission in the degree programme) will be considered. However, the candidate of a degree who, as per rules, discontinued the studies/remained ceased on the university roll/migrated from other institution will not be included in the competition for the award of medal. The award of the medal shall be subject to good conduct and behavior of the student during his / her stay in the university to be certified by the concerned Dean / Director / Principal. The candidate must simultaneously fulfill all the conditions prescribed for the award of medal. If a student fails to fulfill any of the conditions laid down in this behalf, he/she will not be eligible for the medal nor that medal will be transferred to the next student (i.e. lower achiever of marks, %age) on the merit list of the passing students. The following medals, Gold, Silver and Bronze are awarded in each undergraduat degree of minimum 08 semester programme of study for the students who fulfill the following conditions as well as the general conditions simultaneously However, for the undergraduate degree having less than 08 smesters minimum residency, only Gold Medal is awarded on the smae conditions. Secured the highest number of marks in aggregate of examinations in all the courses of study prescribed for the degree along with, qualifying following three conditions. Passed examination in each course of study in first attempt. Obtained 70% or more marks in each semester in aggregate of all the courses. Complete all requirements for the degree programme during the minimum prescribed period. Secured the second highest number of marks in aggregate of examinations in all the courses of study prescribed for the degree along with, qualifying following three conditions. Obtained 70 % or more marks in each semester in aggregate of all the courses. Completed all requirements for the degree programme during the minimum prescribed period. The thesis has been submitted to the Director, Advanced Studies within the prescribed period and is accepted by the examiner in the first attempt and / or the comprehensive examinations have been passed in first attempt. Secured the third highest number of marks in aggregate of examinations in all the courses of study prescribed for the degree along with, qualifying following three conditions. Obtained 70 % or more marks in each courses. Only a Gold Medal is awarded in each Master degree programme to the students who fulfills the following condtions as well as the general conditions simultaneously. 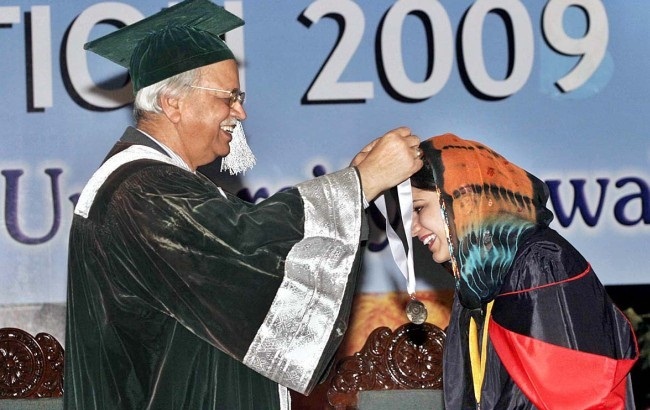 Any sponsored medal will be awarded to the student who completes the degree with highest percentage of marks obtained, in the minimum prescribed duration of the degree programme, without any repetition, subject to good conduct and behavior, certified by the Dean/ Director concerned.